This is no time to risk erosion of our rights. Disabled people should be concerned that the process of leaving the European Union (EU) could see their rights “lost or watered down”, according to a disabled peer. Baroness [Jane] Campbell told fellow peers recently that she had “deep concerns” at the “sweeping powers” that the government’s European Union (withdrawal) bill would give to ministers to weaken equality and human rights laws. The crossbench peer said that she and other disabled people were still seeking an “explicit” commitment in the bill that Brexit would not lead to any weakening of laws that protect disabled people’s rights. Although the government has insisted that all the measures in the Equality Acts of 2006 and 2010 will continue to apply post-Brexit, the Equality and Human Rights Commission (EHRC) has warned that there is currently nothing in the bill to guarantee that. Baroness Campbell said she was concerned that the bill gives considerable “delegated” powers to ministers, which would allow them to make “significant” changes to equality and human rights laws post-Brexit without having to introduce new acts of parliament. Baroness Campbell also raised concerns that, although the bill will transfer most existing EU laws into UK law when Britain leaves the EU, this currently excludes the European Charter of Fundamental Rights. Legal advice obtained by EHRC has raised key concerns about the impact of losing the charter. Without the charter, EHRC says, there will be: less power to protect rights; less flexibility to create new rights and reflect social change; gaps in basic human rights; and a lower level of protection for fundamental rights. Baroness Campbell said that one charter right which would be lost was article 26, which recognises the right of disabled people “to benefit from measures designed to ensure their independence, social and occupational integration and participation in the life of the community”. She told fellow peers that the charter “provides a really important framework for protecting equality, fairness and human dignity, which I believe will be weakened if it is excluded. She said that she would seek amendments to the bill at a later stage that would ensure that “essential rights” are not lost under the bill. 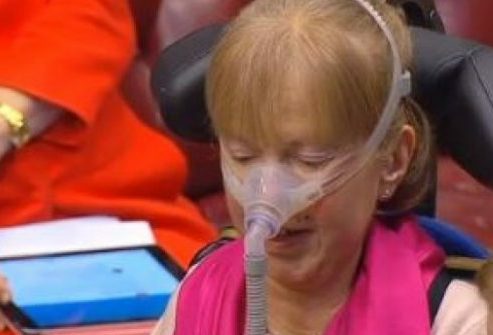 She told Disability News Service after the debate that disabled people should “think about the consequences” of the bill if it passes without significant amendment. She said that EU directives that could be vulnerable to being reduced or scrapped by ministers using delegated powers include the legislation that guarantees assistance to disabled passengers on ships and planes, and a directive which requires the packaging of medicinal products to include Braille labelling. Another piece of EU law that could be vulnerable to delegated powers – if it is passed by the EU in time – is the proposed European Accessibility Act, which is still subject to negotiations between the European Parliament, the European Commission and the European Council, but is likely to impose accessibility standards in areas such as computers, transport, websites and online ticketing. Baroness Campbell said she would fight in the Lords to ensure that “all the EU protections and promotions of disabled people’s human and equality rights are transferred across intact”. Otherwise, she said, it would give ministers power to “start eroding them by stealth”. She also said that she was concerned that the bill was not currently clear on whether CRPD’s existing EU law status will be transferred into UK law. She said this “should worry disabled people, especially those who are involved in the campaign to get government to abide by the CRPD, which we have ratified. Because of the status of international treaties like CRPD, EU law has to be interpreted consistently with the convention, where possible. This contrasts with the situation in the UK, where CRPD is not directly binding in domestic law, and its use to interpret other legislation is more limited. A version of this article appeared on the Disability News Service website on 8 February 2018.